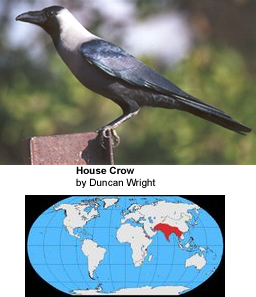 The House Crow (Corvus splendens), also known as the Colombo Crow is a common Asian bird of the Crow family. It is between the Jackdaw and the Carrion Crow in size (40 cm in length) but is relatively slimmer than either. The forehead, crown, throat and upper breast are a richly glossed black, whilst the neck and breast are a lighter grey-brown in colour. The wings, tail and legs are black. There are regional variations in the thickness of the bill and the depth of colour in areas of the plumage. It has a widespread distribution in southern Asia, being native to India, Pakistan, Sri Lanka, Maldives and Laccadive Islands, South West Thailand and coastal southern Iran. It has been introduced to East Africa around Zanzibar and Port Sudan, and arrived in Australia via ship but has up to now been exterminated. It is associated with human settlements in all of its range, from small villages to large cities. Due to a human population explosion in the areas it inhabits, this species has also proportionately multiplied. Being an omnivorous scavenger has enabled it to thrive in such circumstances, given that western standards of hygiene infrastructure in the Indian subcontinent is uncommon. Moreover this species (like several other Corvus species) is known for its cleverness. Among bird hunters it is generally accepted that unlike most birds, these crows can instantly recognise a gun and take flight in an instant. It feeds largely on human scraps, small reptiles and other animals such as insects and other small invertebrates, eggs, nestlings, grain and fruits. Most food is taken from the ground, but also from trees as opportunity arises. It is a highly opportunistic bird and given its omnivorous diet, it can survive on nearly anything that is edible. At least some trees in the local environment seem to be necessary for its successful breeding. It lays 3-6 eggs in a typical stick nest, and occasionally there are several nests in the same tree. In South Asia they are parasitized by the Asian Koel.